Now that you have assessments in all areas of suspected disability, and agree with what they conclude and recommend, it’s time to develop your child’s individual education plan! We suggest that you grab a highlighter pen and highlight your child’s areas of need in each assessment. Next, write one area of need on one index card (or you can use our goals spreadsheet here). Organize each area of need under the following categories: Vision, Hearing and Listening, Academics, Gross Motor, Fine Motor, Orientation and Mobility, Communication, Behavior and Attention, Social/Emotional, Self Care, and Other. Take a look at your stack of index cards or spreadsheet. Which categories are most important to you this year? Learning to read? Communication? PIck your top three categories. These areas of need should be the goals you focus on this year. Now that you understand your child’s areas of need, and have decided the top three areas of concern you have for the year, write a letter of parental concerns to the IEP team. This letter should lay out the areas of need you want addressed by this year’s IEP goals. The IEP must address all areas of need in this letter, so don’t skip this step! Your child’s teacher has probably prepared a draft IEP. 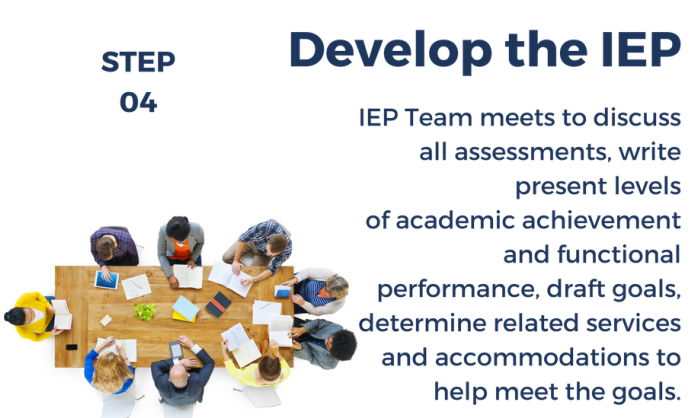 Ask the team for a copy of of your child’s draft IEP at least one week prior to the meeting. Now it’s time for the IEP meeting! You and the team will review all the assessments and, pulling from the child’s strengths and areas of need, will write a clear and concise statement of present levels of academic achievement functional performance (PLAAFP). The PLAAFP is the foundation of the IEP. All goals, services, accommodations, and the final placements flow from the PLAAFP! The PLAAFP statement gives the reader a clear snapshot of what the child can (strengths) and can’t (weaknesses) do. (A peek ahead – what your child cannot do drives the goals! Don’t be afraid of the can’ts. Functional performance – dressing, eating, going to the bathroom; social skills such as making friends and communicating with others; behavior skills, such as knowing how to behave across a range of settings; and mobility skills, such as walking, getting around, going up and down stairs. How the child’s disability affects the child’s involvement and progress in the general education curriculum. (For preschool, this is how the disability affects the child’s participation in appropriate preschool activities such as identifying letters, colors, using scissors, following instructions, and playing games). Uses vague terms (“student has a great sense of humor,” “likes to help teacher,” “enjoys his peers”). The PLAAFP statement is one of the most important parts of the IEP because it serves as the foundation for the goals, services, accommodations, and placement. Take the time needed to draft a good PLAAFP statement. Don’t let anybody rush you through this step. And remember – all the concerns in your parental concerns letter should be included at the end of the PLAAFP statement. Once the PLAAFP statement has been written, it’s time to write goals. Remember, the goals address areas of need – these areas of need are identified in your child’s assessments.